Howdy Ags. And welcome to write right. Today we are going to talk a little about commonly confused words. Ever find yourself writing a paper and struggling to figure out what word you should use? You are not alone. There are many words in the English language that either sound just alike or have very similar meanings, or even both! But it is possible to distinguish between them in your writing. I am going to show you five sets of commonly confused words and explain when it is appropriate to use them in your sentences. First, let’s talk about “accept” and “except.” The only real similarity between these two is in their pronunciation. They are homophones, which means they sound alike. “Accept” is a verb that meaning to approve, receive, admit, or say, “yes” to willingly, while “except” is a preposition meaning excluding, apart from, or not including. Sometimes the second except is even used as a conjunction, similar to the meaning of the word “but.” Note the two ways except can be used in a sentence. Next, let’s talk about complement and compliment. These two are a little tricky since they can both be nouns and they can be verbs within sentences. Complement with an “e” describes something that completes or goes well with something else. Compliment with an “I” describes a polite expression of praise or good wishes. Complimentary can also be used as an adjective. It means free, as in a complimentary breakfast at a hotel. Notice how complimentary can be used in two different contexts? RECAP: “The cute Corp guy’s compliment on her dress was a fantastic complement to Sarah’s day.” Do you see the difference between the two words? Fourth, we will look at principal and principle. The first one can be used as an adjective or noun, but the second is only used as noun. 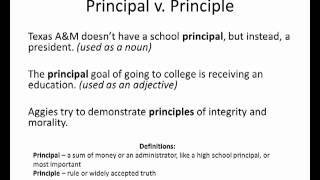 Usually principal, “-pal,” usually refers to a sum of money or an administrator, like your high school principal. As an adjective, it means most important or main. Principle, “-ple,” usually refers to a rule or widely accepted truth. Pay attention to the two ways principle “-pal” can be used in your sentences. Well, that is all I have for you in this edition of Write Right. Hopefully, you will take something away from our discussion of commonly confused words and apply it to your writing. Don’t forget: this is not an exhaustive list of confusing words. There are many word pairs in the English language that are easy to get mixed up. For all writing concerns and questions, remember us here at the writing center.